Understanding how to intentionally use color to your advantage, rather than a hit-or-miss approach, is one reason why personal color analysis is so important. Once you discover and wear the colors within you, it will create visual harmony between your skin, hair, eyes, cosmetics, and clothing. Not only will others notice this harmony and feel positive about the visual effect they are seeing, but you will also feel more attractive, healthy, and confident. 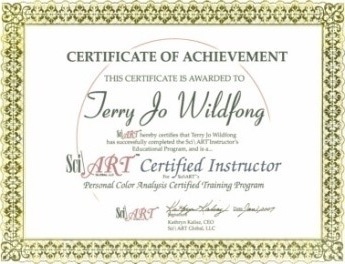 Personal Color Analysis is a process of comparing various colors (drapes) on you to determine your personal color tone. The system is based in the science of color and human vision. The 12-tone system built upon the traditional 4-seasonal approach of the 1980’s to include the other two-thirds of the population who are more neutral in skin tone, neither totally warm, nor totally cool. The Munsell system of classifying color was created based on how humans see color. Because it also represents the way humans are colored, it is the best platform for our purpose to date. This is quite important. A client asked a great question about which Season wears neon lipstick. Neon and fluorescent colors do not appear in human beings. So when we wear them, they remain outside of or apart from us; i.e., the only thing the viewer can see. Our basic premise is we are our most beautiful self when we wear the colors we already are. It doesn’t make sense to put colors together and create wardrobes with colors that make no sense on humans. The 12 seasonal tones were created from Albert Munsell’s 3-Dimensional system that classifies colors by Hue, Value, and Chroma – the 3 components of how we perceive color. Once you know your seasonal tone, you will know what colors to wear to look your best and enhance your natural design. Today, more than ever, the importance of knowing and wearing your best colors isn’t just to look and feel your best, but to also shop wisely and make every penny count. No more clothing or cosmetic mistakes lurking in your closet and makeup drawer. *For women who are minimalists, what if I told you that you only need 2 eye shadows, 2-3 blushes, and 2-3 lipsticks to go with all the colors in your palette? It’s true. And you would be saving not only money, but also time shopping and premium storage space in the house and your purse. For those of you who think the more cosmetic choices the better – great! There are many options for you, too! For more information, click on the links at the bottom of the page, or give me a call at (616) 460-5590. I look forward to hearing from you! It was an absolute pleasure coming for my color analysis! Thank you for spending the time to help me figure out telltale signs to look for to figure out if something works well on me. I’m currently wearing a navy shirt and a blazer that’s between two of my reds, but harmonized with the palate, and am getting a TON of complements. Peace of mind, renewed confidence, a stronger sense of identity: these are the gifts I have taken from my PCA with Terry Wildfong. She is truly a master in her field, and I feel she has taught me to see color in a whole new way. Terry is a delight: she began our session by warming up my eyes and giving me a lesson in sci/art theory. By the end of our session, there was no doubt left in my mind: I am a true winter; no other possibility. If you’re looking for excellence, look no further! My color analysis was more than I had hoped for, and I am enjoying seeing myself in a new light. When I hold the fan against my skin, I see that it is perfect. I have been told many times I “can’t” be a winter and have been analyzed as the wrong season multiple times. Yet my natural choice of colors fits perfectly with Dark Winter, and I feel validated in that. I love the colors, and I look amazing in them. I am totally enjoying the TRUTH of my coloring. Thank you, Terry, for being so kind and positive and professional; you have definitely improved my life!